This understated but grand apartment building was erected in 1912 and converted to a cooperative in 1946. 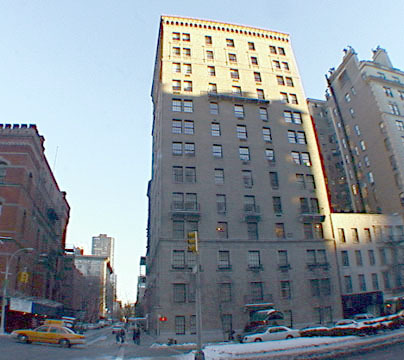 It was designed by J. E. R. Carpenter, the leading architect of luxury apartment buildings in the city of his generation. His other Park Avenue buildings include 550, 580, 625, 630, 640, 655, 812, 950, 960 and 1050. His Fifth Avenue buildings include 810, 825, 907, 920, 950, 988, 1030, 1035, 1060, 1115, 1120, 1143, 1150, 1165 and 1170 as well as 2 East 66th Street. The 13-story apartment building has only 16 apartments, most of which have very spectacular layouts with a circular foyer 13-and-half feet in diameter, a 306" by 186" living room, a dining room 27 by 186" and a salon 186" by 136". The building has a finely detailed, light-brown brick facade in Italian-Renaissance-palazzo style. It replaced an apartment house known as the Adelaide that had been designed by Henry J. Hardenbergh, the architect of the Dakota at 1 West 72nd Street and the Plaza Hotel. The building, which has a canopied entrance and a doorman, is across the sidestreet from the battlements of the impressive 7th Regiment Armory building that was erected in 1880. The armory, which was designed by Charles W. Clinton, is home now to the First Battalion, 107th Infantry, New York Army National Guard and traces its history to the 7th Regiment that was formed in 1906 and how been located on the Bowery between 6th and 7th Streets. It has impressive interiors and now has a tennis club and is the scene of many important art and antiques shows. This area of Park Avenue is very desirable because of its proximity to midtown, many religious institutions and clubs, fashionable boutiques and restaurants and excellent public transportation. Cross-town bus service and a local subway station are very close.